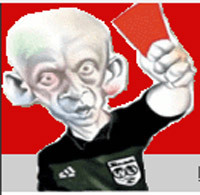 There are sites like the famous red card brought from head to companies that buy emission allowances live events. Many people buy events like football games, boxing matches or any big event atraíaga many people, for broadcast without permission and without charge. Cisco claims to have the solution with a new technology that identifies and emission cuts straight to the pirates. The company, best known for its networking kit, announces a technology that is about to try with partners like television. It is called Streaming Piracy Prevention (SPP) and is based on insert watermarks that people do not perceive, but that a machine can identify where it comes from. For example, if a company acquires broadcasting rights of a football league and is broadcast live videos have easy ask the websites to drop them. Although often these sites was withdrawn within hours or remolonas are made to not piss off users. So the idea is to close the tap Cisco directly to the subscriber, which contracts the service and is pirating the signal. When a pirate signal is found, the system seeks Cisco watermark identifies the chain that issues, this seeks subscriber corresponds to your security system and ask your signal is disconnected temporarily. The system is ingenious, no doubt, but it all depends on running fast and television networks to adapt to this technology. But ... what if identification is incorrect? What if the account used for pirating the signal is stolen from another person without their consent? Will there be a system of three notices for copyright infringement as internet operators in France? Piracy always makes its way when there is a medium that wants to stop her. This system is intelligent, but there is no doubt that programmers will also look how to avoid traceability. 0 Comment about "Cisco has a solution to end 'Roja Directa' and other web pirates"